Tradeshows are a great opportunity to talk to your clients and vendors and further establish your existing connections while forging new bonds. Giving the people who visit your booth a takeaway will ensure your clients and prospects have something to remember you by and will further establish your brand recognition while also serving as a mobile marketing tool that will reach a wider audience. When selecting a reusable bag design, think about how your customers will use the bag and what style will best function for them. This design is great for tradeshows because it is lightweight and can be comfortably worn. The backpack design is also on trend right now and allows your customers the convenience of carrying all of the items they pick up throughout the day while keeping their hands free. The marketing perk of utilizing a drawstring backpack for your next branding giveaway is that when your clients wear your bag, they put your logo and branding information clearly on display for anyone walking the tradeshow floor behind them. Messenger style bags are a sure hit at tradeshows because they are practical and convenient. They are handy to use during the tradeshow since they offer a way to carry all the goodies your clients will pick up while they visit different booths, and they are definitely going to get lots of use when the tradeshow is over either carrying items to and from work, as a laptop bag, or as a carry-on bag while traveling. You can customize the bag to make it even more functional by adding pockets for water bottles, keys, and mobile phones. Plus, you can also add your company’s full color branding info to the front flap, so everyone who sees the custom messenger bag will learn about your brand. The tried and true reusable shopping bag is always a good choice when you’re looking for a tradeshow takeaway. Much like the backpack and messenger style bags, the shoulder straps will come in handy during the tradeshow since it gives people a hands-free way to carry all of the brochures, samples, and items they pick up. The flexible design can also enjoy a long and useful life after the tradeshow by either serving as a grocery bag or filling in when your customers need to carry items to go. Give some consideration to the style of eco-friendly, reusable bag you want and then contact us to help you select just the right bag to market your brand. 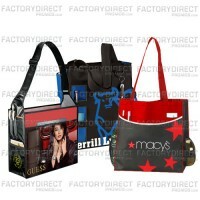 Also bear in mind that all of our reusable bags at FactoryDirectPromos.com can be completely customized. You can adjust the length of shoulder straps and change the material or select different colors for the gussets. Whatever you can dream up, we at Factory Direct Promos can help you create so you are sure to get a completely customized, reusable bag that your customers will love to use. It’s simple! Just give us a call at 866.222.0949 or request a quick quote and we can get started designing your custom reusable bags today! Previous Previous post: Do Single Use Plastic Bags get a Bad Rap?